WAIST HIGH: Nu Shooz Return. 18 years since their last full-length release and 24 years since "I Can’t Wait," Portland Oregon's own Nu Shooz have returned as Nu Shooz Orchestra with a brand new CD. The 14-song Pandora's Box, "a mix of tunes described as 'James Bond meets James Brown,'" was released August 1 and features nine new songs, funk/jazz remakes of "Point of No Return," "I Can't Wait," and "Driftin," and guest appearances by China Forbes, Curtis Salgado, and Echo Helstrom's Ross Seligman. Formed in Portland, Oregon in the summer of 1979 by Valerie Day and John Smith Nu Shooz have changed their line-up over the years, "but in all its various forms, they've always pushed the boundaries between pop, funk, and jazz. Now, with the formation of the NU SHOOZ Orchestra, Portland's favorite soul explorers take one giant leap for mankind with a brave new sound, combining their signature brand of funk with elements borrowed from Film Noir, '60s Spy Movies and even Tarzan." 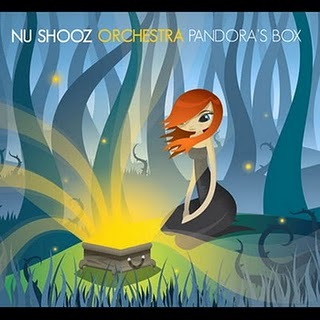 A digital version of Pandora's Box can be previewed and purchased at the Nu Shooz Orchestra store and the physical CD can be found at cdbaby.com. In addition to her duties with Nu Shooz Orchestra Valerie Day performs with Portland's Vibes Trio and co-founded Brain Chemistry for Lovers, a multimedia performance using "music, film and the latest discoveries in the world of neuroscience to explore one of the most universal of all human experiences...Romantic Love."